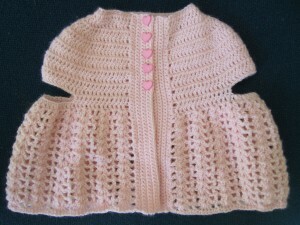 I was lucky enough to get to test a crochet pattern for a wonderful designer based in New Zealand. Lisa van Klaveren has a blog, etsy store, patterns on Annie’s Attic, e-Patterns Central, Ravelry and probably other places too! I also found out she loves Anne of Green Gables too so she is a kindred spirit. When she posted she needed testers on Facebook, I jumped at the opportunity, particularly given a friend had recently had a baby girl but was moving somewhere warmer so the little woollen beanie I’d made her wouldn’t be quite suitable! I tested the sleeves but did not add them to the final cardigan since it would have made it too hot. I really loved the fact that most of it was worked in one piece, saving on the very tedious task of starting off again and joining in new yarn, something I don’t enjoy, just like sewing in ends. Thank you for allowing me to test it, Lisa. Your designs and patterns are really lovely.